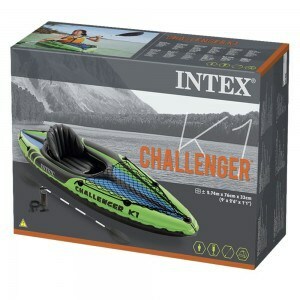 Before you start reading the review of Intex Challenger K1 Kayak, read this. Be it the exhilaration of navigating through rapids or being at peace on a calm river, we can all agree that kayaking boils down to one significant experience, FUN. As more and more people embrace this form of sport, it is evident that the kayak needs to match in quality and durability to provide the experience an individual is seeking. If you are someone who loves to soak in the peace that a lake or a slow-moving river offers, you could check out the Intex K1. Check it on Amazon. Designed for comfort and maximised space, the Challenger K1 Kayak provides a broad and comfortable cockpit space for easy entry and exit. Its durable welded material aids smooth glide on the water while the inflatable I-beam floors add stability. Needless to say, Intex products that are known for its rigorous security standards have also included eye-catching graphics on the K1 Kayak for additional safety. Are you facing problems in choosing the best kayak for your activity? Read how to choose a kayak. We are sure you appreciate that choosing the right kayak is important to maximise the experience you seek. 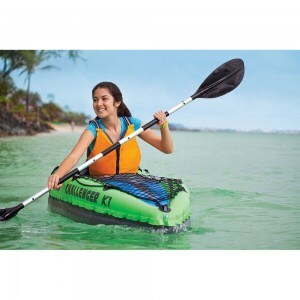 The design and specifications of a kayak play a significant role in performance. To ensure you take an informed decision, here are some pros and cons of the Intex Challenger K1 Kayak that will come handy when you cut down to that purchase! 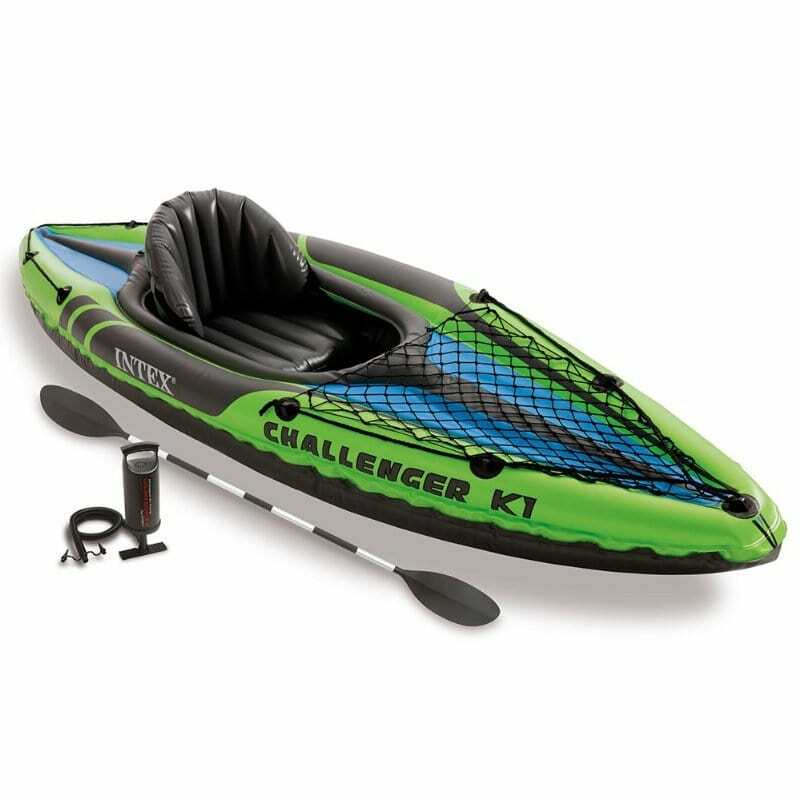 Inflation: Despite a four air-chambered design, the Challenger K1 Kayak does not take more than 4 minutes to inflate! This advantage can be attributed to its efficient hand/foot pump. The ease of use makes it an ideal buy for tweens, teens, adults and elders alike. Once pumped, the Kayak remains sturdy enough for a smooth ride. Transportation: At 27 pounds, the kayak is surprisingly easy to carry! Its packaging is also user-friendly – in a small cloth travel case that is about twice the size of a briefcase. One thing’s for certain, carrying this inflated kayak is easy on the shoulders. Storage: The storage room is aplenty! The bungee cord storage area up front is an ideal storage location for one’s belongings like a fanny pack, water bottle, sandals, spare paddle, etc. There is also some additional storage space behind the seat. Buoyancy: Kayaks usually to tend to hit the bottom when the water levels are lesser than a depth of 6”. Not with the Intex Challenger K1 Kayak! The buoyancy is high on this one. and a perfect spot on purchase for river usage! These skegs, at the centre of the vessel, maintain a relatively consistent non-zig-zag growing pattern was thereby providing directional stability to the kayak. 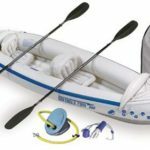 Low Budget: Optimum Value: A Kayak within $70?! For the budget conscious, this is a steal! Uncomfortable seat: The plastic rim around the seat has not been sealed. Hence, the seams create rough edges that could grate against one’s torso and make the ride uncomfortable. Paddle: While the paddle is of high quality, it is not height adjustable. This could prove a challenge for small built individuals! We recommend you purchase other ones for a better experience. Cleaning: Unlike a few other products in the market, the Challenger K1 Kayak does not have an opening in the back. This means that water, sand and any other slush could stay inside the kayak. Cleaning this mess can be a cumbersome exercise! In conclusion, the Intex Challenger K1 Kayak is an ideal ‘pick off the shelf’ due to the optimum value that provides its money’s worth with its durability, versatility and ease of use.